Sometimes you might need to make your color photo black-and-white. You can easily achieve this result using the AVS Photo Editor program. 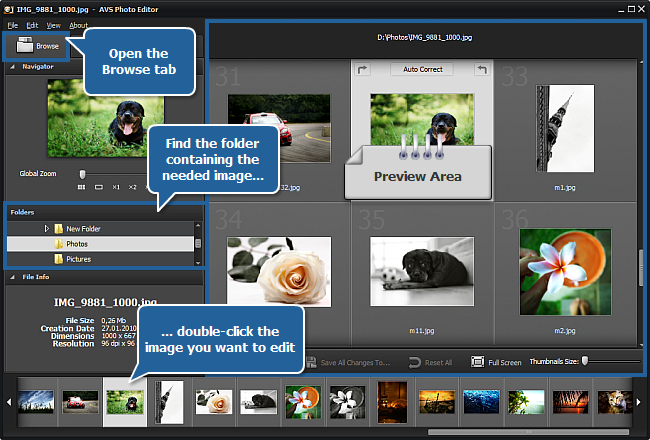 Besides you can adjust some additional settings to make the image look the way you want. As soon as you select an image by double-clicking it, the Edit tab will be opened. There you can see a number of sections situated one under another. Find the Presets section and left-click it once. 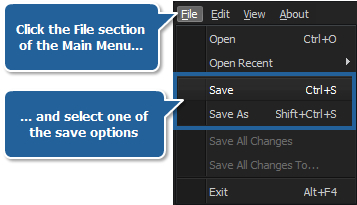 After that the section will open to let you view and select a preset from the list. 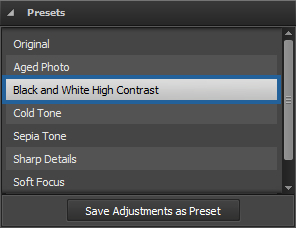 Click the Black and White High Contrast preset. In the Preview Area you will see your picture getting black-and-white. 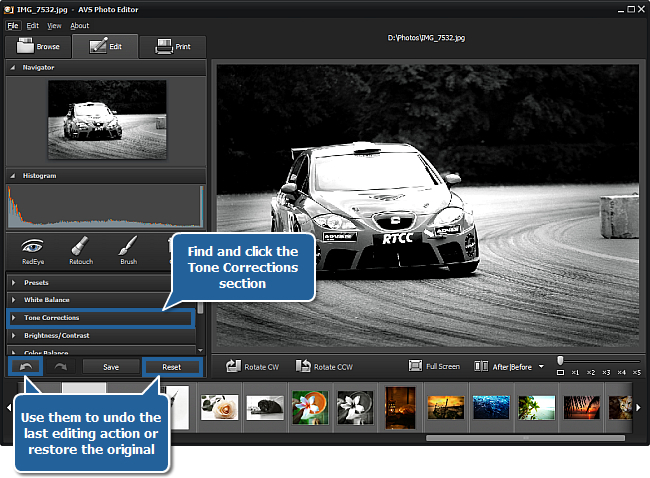 This effect will be achieved by desaturing the photo and adding more contrast and brightness to it. 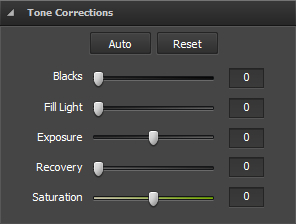 If you are not satisfied with the result you can still correct some tone settings. For this purpose click the Tone Corrections section. Blacks - use it to adjust the overall image darkness. Increasing the setting value expands the areas that are mapped to black. The greatest change is in the shadows, with much less change in the midtones and highlights. Fill light - use it to restore shadow details. Increasing the value allows you to digitally shine light on dark areas and bring out detail that would otherwise be obscured without affecting areas that should be black based on the blacks setting. Exposure - use it to adjust the overall image brightness. Decrease the setting value to darken the image and increase it to brighten the image. Recovery - use it to restore highlight details. 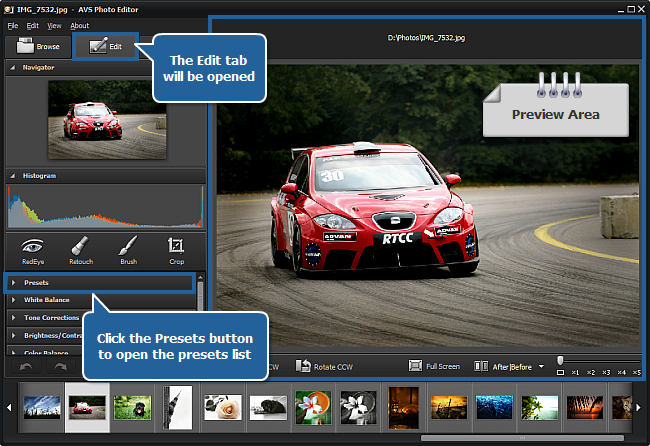 So you can easily bring back some details from most images without changing the overall exposure or color balance. Note: don't correct the remaining setting if you'd like to get a real black-and-white photo, as changing the Saturation value will add color to your photo. 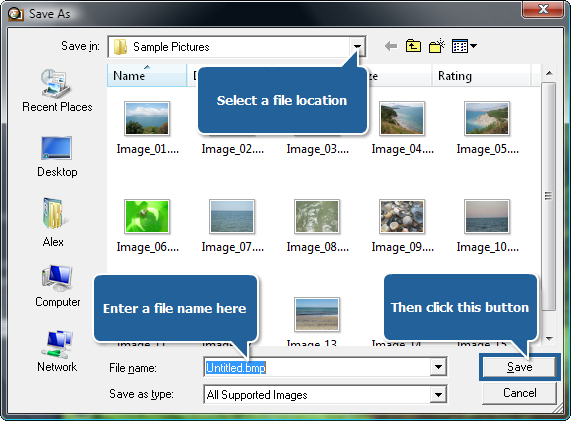 To adjust some of the settings drag an indicator along the slider or enter a value in the field next to the slider using the keyboard depending on the setting you want to change and then press the Enter key. After that view the result in the Preview Area. You can experiment with these settings as you wish. If the result doesn't satisfy your needs, you can undo the last editing action by pressing the Undo button or bring the image back to its original state by pressing the Reset button. These buttons are situated at the bottom of the Edit tab. Brightness - use it to adjust the relative lightness or darkness of the color, i.e. the tonal range of an image. Contrast - use it to correct the difference in visual properties that makes an object in an image distinguishable from other objects and the background. Blur - use it to reduce (negative values) or increase (positive values) contrast between adjacent pixels by lightening or darkening pixels next to well-defined or blurry edges and shadows, visually smoothing and softening or sharpening the image. That's all! So easily you can make your color photo black-and-white.